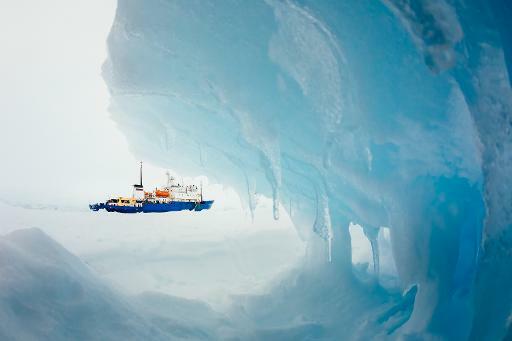 Sydney (AFP) – Gusty snow showers which hampered visibility on Monday forced back an Australian icebreaker struggling to reach a scientific expedition ship stranded off Antarctica, and also prevented a helicopter rescue, authorities said. The Aurora Australis made it to within 10 nautical miles of the MV Akademik Shokalskiy, which is stuck in an ice field, before retreating in the face of freezing winds and snow showers. “The area where the MV Akademik Shokalskiy is beset by ice is currently experiencing winds of up to 30 knots and snow showers,” the Australian Maritime Safety Authority said. The authority said further rescue attempts could be made once the weather improves and the Australian vessel was now in open waters about 18 nautical miles east of the trapped Russian ship. Australia’s rescue coordination centre is in regular contact with the ship, which is carrying 74 people — including scientists, tourists and crew — and has been stationary 100 nautical miles east of the French base Dumont D’Urville since December 24. Its passengers, who had been following in the Antarctic footsteps of Australian Sir Douglas Mawson and his 1911-1914 expedition, remain safe and well on their well-provisioned vessel, the safety authority said. Three icebreakers including the Aurora Australis were called to help free the Russian vessel. But the first attempt, by a Chinese-flagged vessel, was unable to break through the ice while a third vessel was released from the rescue, leaving hopes pinned on the Australian icebreaker. Authorities had hoped that a helicopter on board the Chinese-flagged vessel that remains in the area would be able to evacuate the passengers if the Aurora Australis was unsuccessful. But the safety authority said Monday it was also “unsafe to attempt to launch the helicopter from the Chinese vessel” given the weather. Chris Turney, one of the leaders of the scientific expedition, said via Skype from the stranded ship that those on board were in good spirits and wanted their families and friends to know they were safe and well. “It’s Antarctica, we are just taking it one day at a time,” he told AFP, adding that Monday’s failed rescue had been hampered by very poor visibility as much as the ice. Turney, who is professor of climate change at the University of New South Wales in Sydney, said satellite images indicated that their vessel had become stuck in ice which had broken away from a glacier. The fierce winds had pushed it into an area of normally open sea, blocking the ship’s progress, and this ice was now three to four metres thick in some places, although in others there were gaps with no ice. Turney had earlier tweeted that cracks were developing in the ice around the bow of the ship, something he hoped would help free the vessel. The team onboard has been carrying out the same scientific experiments which Mawson’s group conducted during the 1911-1914 expedition in the hope they could help in climate change research. Several members of the team have already battled sea ice to reach the historic Mawson’s Huts — built and occupied by the 1911-1914 expedition — which have been isolated for years by a giant iceberg.